Building and marketing your brand online can be daunting, especially considering that your digital presence needs to be supported by a clear strategy and ongoing management. 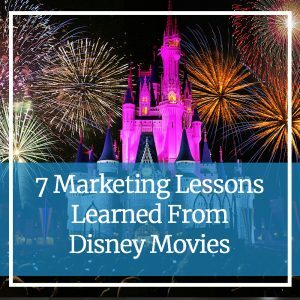 So how can you put Disney’s advice into action? Why not turn to the movies that helped grow and support the Disney brand. Here are some tips and tricks to help you get started, gleaned from some all-time favorites. As Alice quickly found out, this seemingly simple question can be the hardest one to answer. Sure, you have a service you sell. Yes, you help your clients. But what is it that drives you? What issues matter most to you? What is your goal in helping your clients? Defining yourself, and showcasing who you are on your website, can help prospective clients get to know you even before they speak with you. Regardless of how you define yourself, Aladdin, Mulan and many others bring us back to one key theme: Always be true to who you are. Instead of building your brand by doing what your competition is doing, express your own identity. Do you follow a certain philosophy that wows your clients time and again? Are you involved in your community? For instance, do you sponsor organizations or events? Are you part of a company that has been passed down from generation to generation? Highlighting messages like these helps create a unique identity. In turn, this will help build personal connections and can lead to new business. Prospective clients search for someone who will treat them well and give them what they’re looking for. How do you do that online? The best way to do this online is to provide your prospective clients with information they care about the most—to offer information that others aren’t providing. Doing this will allow you to outshine your competition. Good places to offer this information include in your website copy, your blog posts and your social media updates. As a service provider, you pride yourself on delivering excellent customer service. But what does “customer service” mean to you? Define this concept by highlighting specific actions you take that show your commitment to service. Do you answer your own phones? Do you offer a proactive service, or are you there to help only when folks call on you? Are you prompt in responding to emails? What do you do to go above and beyond the basics to show your customer that you’re truly paying attention to who they are? When you approach your work with enthusiasm, clients will be more inclined to trust you and want to work with you. Whether you blog, tweet or post on Facebook, be sure to use an upbeat and welcoming tone. Perseverance always wins the day, so just keep swimming as Dory does in “Finding Nemo.” Find new and creative ways to add to your online presence whenever possible. As long as you keep going, you will build a following that will hopefully lead to more prospects and, in turn, a more lucrative business. You don’t need a magic mirror to tell you what makes you unique. But, you may need help making the magic happen. If you find yourself needing a helping hand to guide your online content marketing initiatives—but you find yourself short on cute, woodland creatures—turn to our team for help.